The Internet Society Accessibility Special Interest Group (in formation) June 2018 call will be convened at 8:30 am EDT (12:30 UTC) today Wednesday June 20 2018.. On the agenda this month, Judith Hellerstein will talk about last week’s M-Enabling Summit, Mohammad Shabbir on the accessibility of ISOC’s Inforum platform, and Gunela Astbrink invites ideas for how the Accessibility SIG might participate in the 2018 ISOC Chapterthon which has the theme IoT security. All are welcome to join the call. Auto-captioning will be available. Join the @InternetSociety @a11ysig hangout 1pm ET Today Weds Oct 4 #a11y – all welcome! 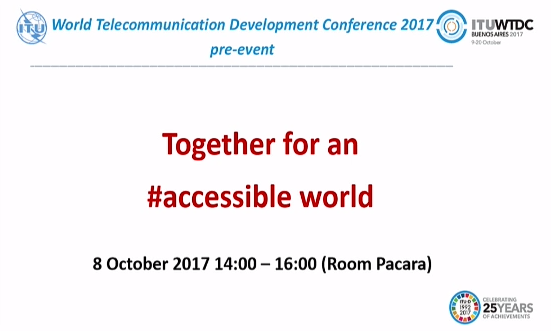 The Internet Society Accessibility Special Interest Group (in formation) will this week be at 1pm ET on Wednesday Oct 4 2017. Please join and share your #a11y interests. This week will be an open discussion, and is the first under the A11ySIG banner. All welcome!